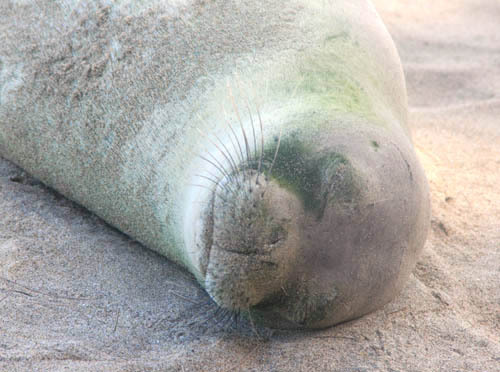 When Kenji Suzuki told me he saw a Hawaiian Monk Seal on Kee Beach as he backpacked out from Kalalau, I enthusiastically made my way to the sandy shores of the beach to look for the seal. 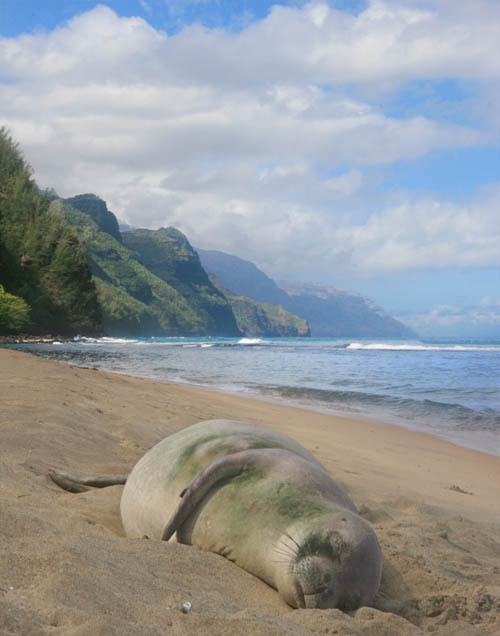 Just as he said, a cute young Hawaiian Monk Seal about 5 feet long was napping on Kee Beach. A handful of us lingered for quite some time around the seal hoping it would wake up, open its eyes, and move about. We were not disappointed. 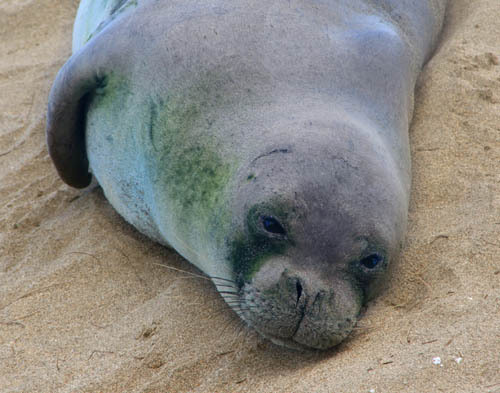 Hawaiian Monk Seals (Monachus schauinslandi) are an endangered species endemic to the waters of the Hawaiian Islands. Known as “Ilio-holo-i-ka-uaua” in Hawaiian or “the dog that runs in rough waters” there are only an estimated 1,500 of these creatures left in the wild with the vast majority of them living in the Northwest Hawaiian Islands. 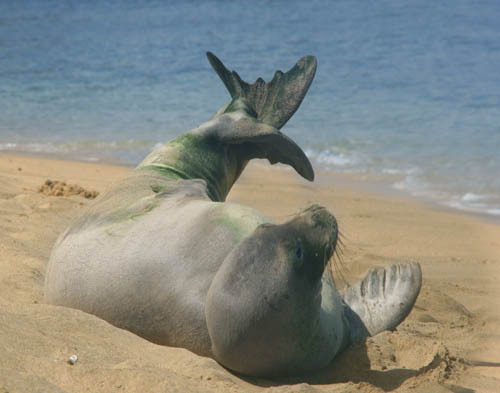 Hawaiian Monk Seals can grow to 7 feet in length and weigh between 400 and 600 pounds. They can dive up to 600 feet deep and can stay under water for up to 20 minutes where they hunt for fish, octopus, eels and lobsters. After turning over, stretching, and scratching itself, the seal closed its eyes again and returned to napping on the sandy shores of Kee Beach. What a life. This is the 10th and last blog entry in a series of posts about my Kalalau backpacking adventure with 14 HTMC friends over the Labor Day weekend. The previous (9th) entry is here. Many thanks to Larry Lee, Justin Ohara, and Mike Algiers for organizing this backpacking trip to Kalalau from August 29 – September 4, 2008 and to my backpacking buddies for filling the trip with a lifetime of fond memories: Helene Sroat, Thea Ferentinos, Kristin Chibouchas, Jill Moratto, Miyo Kimura, Gay Kong, Clayton Kong, Kenji Suzuki, Pat Rooney, Allen Shiroma, and Dusty Klein. This is unbelievably lucky to see a beautiful setting with such a rare seal! Your photos are stunning and unique (as always)!